The Sun Play Casino will then reward you with a bonus (Welcome Bonus is for new players only). The terms and conditions of the bonuses vary between different casinos and might also change over time and between different countries, so it is important to compare the different offers and read the T&C for The Sun Play Casino before signing up. The Sun Play Casino is officially launched in 2017, under the flag of Nektan Gaming company, a software developer and the owner of around 30 more online casinos. The legitimacy of their operations is certified by Gibraltar Regulatory Authority and UK Gambling Commission, while the randomness is regulated by the company’s own experts and certified by independent testing agencies, such as NMI. As an online casino focused on mobile market, The Sun Play Casino is an easy to navigate platform that offers a perfect blend of simplicity, decent gaming offer provided by the best software developers in the industry and a modern, somewhat loud design, which simply calls to action with its bright colours. Unfortunately, players from outside UK, Ireland, Germany, Canada and New Zealand will not get to enjoy Sun Play casino, since all other countries apart from the ones mentioned are restricted. Those who reside within the approved territories will be pleasantly surprised by the hassle-free registration process that allows their players to open a free account in no more than a few steps. New members will have a lot to look forward to, from the wide range of software developers to a generous bonus offer available to all first time depositors. Together with Nektan releases, Sun Play features an excellent catalog of games provided by the best software developers in the business. The site also allows the games to be selected according to the provider and the full list of developers can therefore be found on the left side of the screen. NetEnt, Microgaming, Elk, IGT, Red Tiger, Scientific, NextGen and Blueprint are only some of the companies partnering with Sun Play and other Nektan casinos. The games are divided into 6 separate sections and categorised according to popularity, instant win feature, progressive jackpot and date of release. There are two additional categories, Exclusive and Sun Play Games, including mostly Nektan and Konami developer games. Players who are mostly interested in the slot volatility will find another sorting tool at the very bottom of the screen, allowing you to narrow your search down to games with only a certain type of wins – with 5 filtering options available, one can make a selection in accordance to the level of potential winning amount and the frequency rate of the payouts. Mainstream releases and most highly rated slots are grouped under Player Favourites, New Games and, to a certain extent, Jackpots. This is where one will be able to find the best slots launched in the past decade and the latest games, fresh out of the developer’s oven and made available on Sun Play platform while they are still steaming. Most talked about slots and the games that generated a lot of buzz over the years are flagged as Hot and by clicking on that option slots like Flowers, Winter Wonders and Gonzo’s Quest will be filtered in both demo and real cash play. 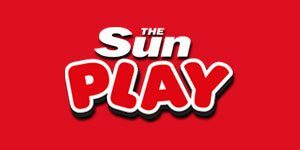 At the moment there are no table games available on the Sun Play, which is a major drawback, but hopefully, this is not a permanent policy and maybe the casino will provide at least a couple of table and card games in the future. A limited offer of Bingo, Lotto and Scratch card games is available and most can be traced to Instant Win category. Live Dealer tables are not a part of the gaming offer in the Sun Play casino. Account holders have a vast choice of payment methods, which one can select from the preferred payment drop box menu during the registration process. The accepted currency is pound sterling and euro and means of payment PayPal, Skrill, Neteller, Trustly, Boku, Paysafecard, Visa, Visa Electron, MasterCard and Maestro. All the transactions are handled according to the safety regulations set by credit card issuers and e-wallet providers; the minimum deposit amount is £10, unless you are transferring the money via Boku mobile, in which case £5 is added and 15% fee is applied. Withdrawals come with the same minimum amount, while the maximum that can be pulled out of your casino account is £2,000. In most cases, pending time will last up to 3 business days and the time needed for the withdrawal to settle is 1 to 3 business days. All the details regarding the deposits, withdrawals, safety regulations, bonus offer and general terms & conditions is provided under FAQ sections, but if you are still not able to find the answer to your question, Sun Play casino representatives can be contacted via email, phone and Live Chat. If you are in need of an immediate assistance, live chat is the best option, as long as you submit your inquiry during customer service business hours, which is 8.00 to 00.00 Greenwich Mean Time. The response time is practically instant and the level of efficiency extremely high.